In 1881 Mr. Albert Smith who later became the Mayor of Vailsburg owned this property located on the southeast corner of South Orange and Sandford Avenues. 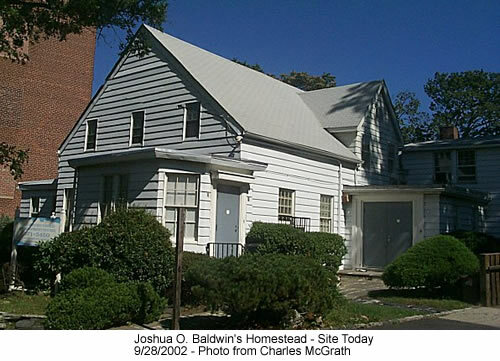 This was the homestead of Joshua O. Baldwin. This house was built in the latter portion of the 1700's . Around 1900 A.D. It was known as the Raub Homestead. It's wide front porch and broad lawn containing a brook (branch of the Elizabeth River) faced South Orange Avenue. This home was the scene of many annual Fourth of July celebrations. These took place while Vailsburg was a independent borough (1895-1905 A.D. ). It was later remodeled although most of the old time charm remained. I'm sure many of us remember it as Burn's Funeral Home. Today it's a day care center.